If you are going to have an equine, you must make sure that he or she is well-trained. This doesn’t just mean the animal has been taught a lot. Rather, it means that you have developed a strong and trusting relationship with your equine that allows you to communicate your intentions clearly. Without this, all the training in the world will not do you or your horse the least bit of good. This is why good horse training begins with good rider training. Before you attempt to work with a horse, you must be sure that your own skills are up to snuff. When you understand how to communicate with a horse using your whole body, voice, heart and mind, you are ready to engage in training. Begin with good lessons for yourself and your children so that you can learn the basics of good horsemanship. 3 Pay Attention To Ear Position! 4.1 How do you lead a horse correctly? 5.1 What’s the difference between lunging and long-lining? If you can start with a foal and develop a good relationship, that’s best. If you are starting with a mature horse, don’t rush. There is no time limit on how long it can take to break a horse. Give your new horse time to settle in and get to know you before you begin working with him or her. Focus on feeding, grooming and just spending time together for as long as a month before you begin any kind of basic horse training. This investment in time will pay off in good communication. To establish a rapport with your horse, it’s important that you understand a bit of equine language. Here are some of the sounds and signals your horse will give you. These are all forms of communication. Pay attention! Nicker or Whinny: This is a sound a horse makes in his throat. His mouth is usually closes when nickering or whinnying. This is a greeting or a call. Neighing: This is like nickering or whinnying but louder and more extended. This sound can be a sign of fear or anxiety, or it can be a call. Pay attention to your horse’s body language to interpret this. If he is pacing or running back and forth and neighing loudly, it is a sign of anxiety or fear. If he is standing or running and looking off into the distance, it is a call. Your horse may sense there is another horse nearby but out of sight. A neigh can also be a warning to other horses in a group. Snorting or Blowing: When horses are excited or startled they may snort or blow. This is usually accompanied by an alarmed expression and head held high. Sighing: When your horse lowers his head and exhales fully through his nostrils, it is a sign of relaxation. You may see this after a good ride or workout or simply in a contented setting. Note that if you have a donkey or mule, vocalizations will naturally vary. Donkeys may make a low moaning sound in the throat instead of nickering and will bray loudly instead of neighing. Mules tend to combine horse and donkey sounds, so you might get a whinny followed by a low moan or a neigh followed by outright braying! Pay Attention To Ear Position! Your horse’s ears can tell you what he is thinking and can give you a clue as to his intentions. When riding, it’s best if your horse has one ear forward and one ear back. This means he is listening to what’s ahead and also to you. A neutral, relaxed ear position can also mean this. Ears perked forward means your horse is very attentive to what’s ahead. He may have sensed or heard something unusual. Pay attention. Ears pinned back can mean your horse is angry or defiant. Watch out! Take a moment to figure out what the problem is and rectify it. One of the first things a horse should learn is how to be haltered and led. If you are starting out with a foal, begin “halter breaking” at about 6 months. If you are starting out with a fully grown horse who is not halter trained or does not lead well, you can still correct these problems, but it will take a bit more patience. Be sure to take time to build a relationship with your horse. If you can get to a point at which he follows you just because he wants to, your work in halfway done. How do you lead a horse correctly? 1. Position yourself on the left (near) side of the horse’s head. 2. Use your right hand to hold the lead rope about half a foot from the horse’s head. Use your left hand to hold the remainder of the rope in a loop or folded. Be careful not to wrap the rope around your hand or arm as this could result in serious injury. 3. Always lead from the left. Face forward and take a step forward. Say “Walk on!” or “Come along!” or something of that nature. The horse should come along. If he doesn’t, give a little tug to encourage him. 4. When you want to turn, use your right hand to guide the horse’s head in the direction you wish to go, and use your body to signal your intentions. Your horse will see where you are going and, if all is well, will follow you. 5. When you want to stop, stop walking and pull back slightly on the rope. 6. To back up, turn to face the rear of the horse. Switch the lead line to your left hand, pull back on the lead line and (if you need to) press the horse’s chest with your right hand, while saying “Back up!” or whatever verbal cue you have decided on. Step in the direction you wish to go (back) to signal your intention to the horse. 1. If your horse balks, don’t get into a tug-of-war with him. You will not win. Instead, redirect him by turning him in a circle and then heading off in the direction you wish to go. 2. Don’t try to get your horse to follow you while you are facing him. This doesn’t make any sense. If you want your horse to follow you, you must be going somewhere! 3. Avoid leading the horse by the halter without a lead rope. It’s easy to get hurt doing this. 4. Keep your hand close to the halter on the lead rope. Don’t allow the rope to dangle loosely as you or your horse may become entangled. 5. It’s always a good idea to wear leather gloves when leading a horse. Even a gentle, well-trained horse can become startled and pull the rope through your hands. Without gloves, this can cause a nasty rope burn. 6. If your horse becomes startled or frightened and suddenly jumps or pulls away from you, it’s better to let the lead line slide through your hands slightly, in a controlled manner and give him a little space than to cling to it and try to stop him. Remember, your horse is much bigger and stronger than you are. If he is frightened and you are struggling to hold onto him, you become part of the problem. Have the confidence to give him the space the lead line allows without letting go of it. You can avoid dislocating a joint by developing this habit. 7. Beginning leading lessons should be brief and should take place in an enclosed area that is free of distraction. Work with your horse for ten or fifteen minutes at a time. If you are working with a foal, be sure mom is close at hand. Otherwise, you’ll be dealing with a lot of distress and your lesson will not go well. 8. If you are working in an arena or round pen that is unfamiliar to the horse, allow him to walk around on his own to explore for a while before you begin working with him. This will help prevent sudden frights and surprises. 9. Some bit training may be also a good idea, even if you personally do not want to use one and prefer bitless bridles or hackamores (read also our recommendations for the best bitless bridles on the market). There are hundreds of different types of horse bits out there. Buy as comfortable horse bit as possible when starting training. When a horse is old enough and strong enough to begin training for riding, it is also time to start long-lining, longeing (or lunging). This is a form of groundwork that allows you to give your horse a good workout prior to training sessions and helps your horse learn voice commands and reining signals. A horse who has experience with this activity will have a better understanding of how to respond when you begin to ride. Lunging helps a horse learn to stop, start, change directions, listen, change gaits and wait patiently. Lunging with a 30′ line allows you to teach your horse while you are safely on the ground and a good distance away, so it is a bit safer than doing groundwork with a 6′ lead rope or riding a “green” horse. It is a very good way to help a frightened horse gain confidence and experience. 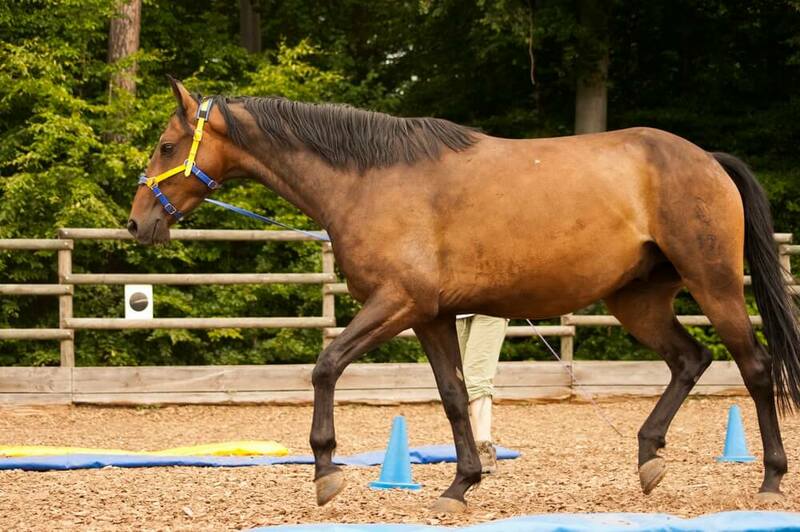 Even after a horse is well-trained, lunging is a good exercise activity. When you engage in lunging your horse, you learn a lot about his or her responses and body language, and vice-versa. It’s a good way for trainer and horse to get acquainted, and it’s a good transition activity. You can warm your horse up before riding and also cool him down afterward. It’s a good form of rehab for horses recovering from illness or injury. Like riding, lunging can put stress on a horse’s limbs, so be sure to wait until your horse is two years old before you begin serious lunging sessions. Yearlings can have light sessions of walking and trotting just to get used to the activity. Don’t use a twenty-five foot lunge-line because working close circles can be damaging to your horse’s legs. Always use a lunge-line that is between thirty and thirty-five feet long. lesson to teach the new lesson. Don’t overuse lunging as your horse will tire of it and it will lose its effectiveness. Don’t require your horse to canter for an extended period of time. Be sure the ground is firm, smooth and provides good traction. Work very lightly with horses younger than two years of age. If your horse has a sore back or is recovering from an injury, you may decide to do some basic exercises to help him build strength, and develop a well-defined topline. Understand that horses have very good memories. It’s very important that you perform lunging activities correctly and in a positive manner. If you teach your horse correctly, he will remember. He will also remember if you teach him incorrectly. Mistakes can lead to wasted time because you will have to work with your horse to unlearn them. What’s the difference between lunging and long-lining? Long-lining (aka: double longeing or long reining) is done using two lines. It can help your horse learn how to respond to reining. When looking for equipment for leading and lunging, don’t skimp. High quality lunge lines and lead ropes perform better and last longer. Get a soft, flexible, strong polypropylene line. These are easy to hold onto and are less likely to produce rope burns. The best quality lunge lines, lead ropes and best halters are treated with ultraviolet protection so that they do not fade and become damaged by the sun. Polypropylene is also water resistant and does not harbor mildew. It is durable and rot resistant, too. Be sure the line you choose has a brass swivel snap for durable, tangle-free use. Polypropylene ropes come in a wide variety of colors to match your existing equipment. You can find them at feed stores, tack shops, in catalogs or online. Finally, don’t forget to buy a good horse blanket or rug that you should be using after the training session to keep your horse warm. It can be very difficult to get a horse into a trailer, especially if you are working with an unfamiliar horse. With your own horse, if you have done your groundwork and built a good relationship, it shouldn’t be too difficult. Many people approach trailering all wrong and waste a great deal of time and energy trying to force a horse to load. Common sense should tell you that this is a battle you will not win. Horses are much bigger and stronger than people, and if you have a horse who does not want to get in a trailer, you are not going to be able to push or pull him in. If you insist on trying, you may just get hurt. If you attempt to beat a horse into a trailer, you have no business handling horses, you’ll probably get kicked, and you’ll deserve it! There are many good ways to teach your horse to load up trouble-free. As with most things having to do with horses, patience and common sense are the keys to success. 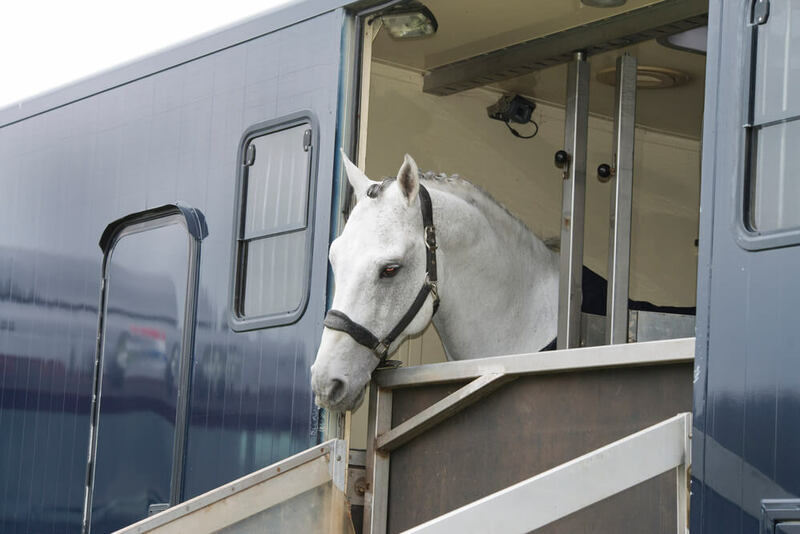 If you are dealing with a horse who has had a bad trailering experience, you will need to be extra patient. If you can get started with your horse when he is young and practice loading frequently (even when you aren’t going anywhere) you are a lot more likely to have a successful and pleasant experience. It’s best if you have a trailer you can walk through. In other words, it should have a larger door at the rear that both you and your horse can walk through and a smaller door at the front so that you can exit without the horse. If you’ve done your groundwork, taught your horse to lead properly and built a good relationship, you may just be able to lead him right into the trailer without any problems. Be sure to have a helper on the outside to shut the door behind you as you exit through the front. If you have the ability to leave the trailer where your horse can safely examine and explore it on his own, this can be a good way for him to get used to it. Some people feed in the trailer so that the horse simply becomes used to hopping right in when it’s meal time. Once your horse becomes used to getting into the trailer, take him for a few short trips just for the experience. Take him for a ride in the trailer over smooth, quiet roads and then go back home. That will get him used to the idea that the trailer is not something to be afraid of. Practice loading up and going on short rides at different times of day and night. This will get your horse used to the idea that trailering can be done at any time. When loading your horse, it’s good to use a ramp or be certain that there’s not a huge amount of distance between the ground and the floor of the trailer. Your horse should only have to take a short step up to go inside. If your horse becomes balky about trailering, don’t lose your temper or your patience. Try redirecting him by circling him. If this doesn’t work, try luring him in with feed, but don’t rush it. Take your time. It’s always a good idea to load up inside a corral or other enclosed area so that you can leave the horse alone with the trailer for a few minutes or even a few days. This is especially true if you are dealing with an unfamiliar or untrained horse. This gives him a chance to explore it. You may just want to fill his feed dish and set it inside so that he can load himself. Always give yourself plenty of time when teaching trailering and when actually loading up to go somewhere. If you are rushed or trying to force your horse to load up, you will ensure your failure. Finally, don’t forget to install a good horse trailer camera for peace of your mind. Even if you participate in highly competitive events and shows, you need to remember to allow your horse to be a horse. It’s always important to keep your horse engaged and active, but don’t overdo it with demanding training. Set a regular schedule of training before events and competitions, but remember to include enjoyable relationship-building activities and rest for yourself and your horse. After your event is over, take it easy for a while. Ride lightly and spend a lot of time on easy, pleasant activities. Remember that your horse also needs the companionship of other equines (although some horses may develop a habit of kicking other horses). Allow time for turnout and socializing activities, weather permitting. Remember that your goal is to avoid having a stressed-out horse, so if it is too hot or cold or flies are a bother, you may want to keep your horse in or use a good horse calmer. If your horse has to spend a lot of time in his stall, be sure to provide free-feed hay, a salt lick and perhaps some equine toys, such as a hanging ball or other interesting items to alleviate boredom. It’s also a good idea to adjust your horse’s diet when you are not preparing for a competition. A horse who is not working should have a more natural diet consisting mostly of high quality hay and pasture. Be sure to make any dietary adjustments gradually so as not to upset your horse’s system. Changes in diet should take about a week to complete. Don’t let your horse starve either as it may start to chew wood and eat things that he/she wouldn’t eat otherwise and that are unhealthy. Remember to attend to all maintenance tasks regularly, even when you are not competing. Grooming, farrier visits and veterinary care are all important aspects of care and training. When you have a good relationship with your horse, he enjoys riding and racing as much as you do. When you are not preparing for an event, ride for pleasure. Take interesting trail rides and enjoy spending time together. Your relationship with your horse accounts for a huge proportion of the success of your training. Great tips on training a horse! I always read that it has a lot to do with the handler and the horse relationship. Thank you for putting this resource together and making it easy to read.